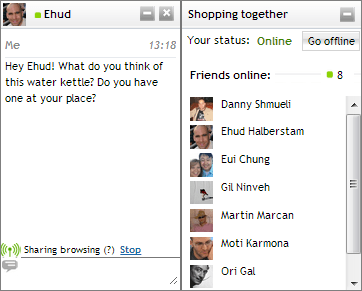 You can shop together with your friends on Shop Your Way using the chat window on the bottom right of the screen. This means you and your friends are browsing the same pages on Shop Your Way at the same time. It's just like being in the shopping mall together, without leaving your home! When your friend starts sharing his/her browsing with you – click “Watch” and Shop Your Way will automatically take you to the same page your friend is currently browsing. This can work the other way around as well. Click “start sharing browsing” and if your friends want, they can start “watching” you and be taken to whatever page on Shop Your Way you're browsing. Privacy: the sharing setting applies only to the current chat window. Other users who are not part of this chat will not be able to see what you browsed. In any case, the existing privacy settings you applied to your catalogs and profile also apply. Users in this chat window will not be able to see any catalog that you marked “private” or to see your private profile information even if you're sharing your browsing with them. You can use your Facebook account to sign into Shop Your Way. When using your Facebook account, you will be able to access all the features of Shop Your Way that require you to be a registered Shop Your Way user. You control what part of your Facebook profile information is imported to Shop Your Way, you may choose to not import any data to Shop Your Way at all. To connect your Shop Your Way account to Facebook, click on your profile icon in the upper right corner, and select "Edit Settings" on the drop down menu. On the page that appears, you will see your profile settings. On the left navigation bar, you will see a section labeled "Facebook." By clicking on this tab, you will be prompted to a button that allows you to connect your Facebook account with your Shop Your Way account. Shop Your Way can automatically infer your interests based on your public activity on Shop Your Way (only an activity that is visible to everyone), which includes actions like commenting, reviewing, recommending, and voting on items from a specific Shop Your Way category. Once Shop Your Way thinks that you have performed enough actions to infer that you are interested in a specific category, it will add that category to your “Interests” list.